One of the main reasons why people attend events is to acquire fresh information. A successful knowledge transfer is the key to gratifying experiences. The whole point of running events is to spread insights, ideas, and compelling data that has are of high relevance for the attendees. But sometimes this can be challenging, especially when the information is transmitted in a different language than some of your event guests speak. As Kevin Van der Straeten explains in his book, "The main language used at an event by the chairman/presenter and the speakers is known as the floor language (or sometimes the active language)." Kevin highlights that "during relatively simple conferences there will usually be just a single floor language, although other languages may also be occasionally used (for example, during Q&A sessions)." On the other hand, he points out, "During larger congresses there may be more than one floor language. 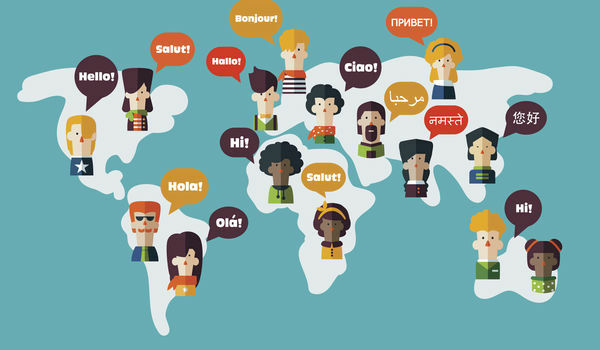 The number of floor languages at an event will determine the number of translators you need." From running international events to inviting foreign speakers at your events, you'll encounter plenty of occasions when you'll have to master the management of simulations interpretation. And taking into account that the complexity of a multilingual conference is far superior to a simple event, you’ll have to face additional logistic challenges. First, you'll have to determine a certain budget for interpreters, audio engineers, and equipment. Second (if it's the case), you'll have to agree upon the installation of simultaneous translation booths. Third, you'll need to decide which dynamic will be most the effective for providing the attendees with interpretation headphones. To help you successfully navigate through these challenges, we put together a list of steps you should consider when planning a multilingual conference. If you are planning a multilingual conference, there's one more thing to think about when searching for the perfect venue: interpretation equipment. Before choosing an event venue, ask yourself if you are willing to pay for the mobile booths’ rent or if you want to have a space with built-in booths. What’s the difference? If the venue already has in-house booths, you don't have to worry about the hassle of finding simultaneous translation providers. However, you will have to consider aspects such as how many booths the venue has (making sure the number corresponds with the number of interpreters you'll need), as well as the number of interpretation headphones (the venue must have enough headphones for all the attendees that will need them). In addition, if the venue providers have already built-in booths, they can probably offer you the adjacent audio equipment. Mobile booths, on the other hand, are rented and installed in the room a few days prior the event. In this case, you must be aware of the number of booths you need and the total space you have to install them. In this case, you may also need to rent the headphones. If the venue you've rented doesn’t have built-in booths or audio equipment, consider yourself forewarned that this is not a quick procedure. That’s why, when agreeing upon the tasks timeline, check with the sound engineers to see how much time they’ll need to install everything. Moreover, you definitely want to make sure in advance that the sound systems are working. Schedule an hour about one or two days before the event to meet with the sound engineers and test the systems. Aside from making sure that the equipment works, you also have to brief both the sound engineers and interpreters on the interpretation dynamic. During the meeting, walk everybody through the event agenda and specify how long a simultaneous interpretation will be needed. Discuss all the details and ask the sound engineers and interpreters what they need to carry out their tasks. Your work is not finished with coordinating the booth installations and briefing the sound team. As an event professional, you’re also responsible for easing up your interpreters’ workload. How? First, you should reach out to your international speakers and ask them to send you their speech. Then, a few days before the event, send the translators all the presentations that will accompany each speaker’s speech, giving them time to translate. Finally, you must guarantee a friendly work environment. Make sure your interpreters have enough bottles of water, good lighting, and comfortable seating. A few days before the event, discuss with your team how you’ll manage the attendee flow, and when the attendees will need interpretation headphones. You may have a few sessions only that require translation. Also, agree upon the type of document the guests must leave in exchange for the equipment. For example, it can be their passport, driving license or ID. Subsequently, figure out how to set up an efficient space for the headphones. Make sure that there’s enough room to avoid a swarm of people trying to grab headphones. Running a multilingual conference shouldn’t be a difficult task. Obviously, it adds a few more things to your to-do list, but once you automate the sound logistics, everything should be fine. First, assess your needs, and then check the event venue’s facilities to see what’s already available. Second, stay in constant communication with both the interpreters and the sound engineers to prepare and test the simultaneous translation equipment. It’s also your responsibility to find out the interpreters’ needs and provide them a comfortable work environment. Finally, you must discuss the attendee flow with your team and figure out how everyone can get their translation headphones without creating a traffic jam.